ITALIE – Milan - A small church on the outskirts of Milan containing archaeological finds from early Christendom has been declared a heritage site. 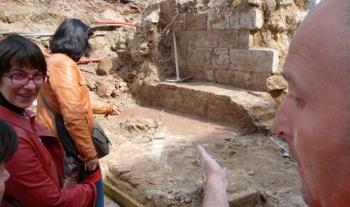 Excavations of the Church of Saints James and Philip, which began in March, led to discoveries that are especially important to the history of the Lombardy region and its earliest inhabitants. Findings related to the community, once known as Nocetum, include tombs of an infant and an adult, and coins dating from the time of Roman emperor Magnentius, usurper of the empire from 350 to 353. The church was undergoing restoration due to damage caused by humidity, and was declared to be of historical interest by the Superintendence for Cultural Heritage for Lombardy. 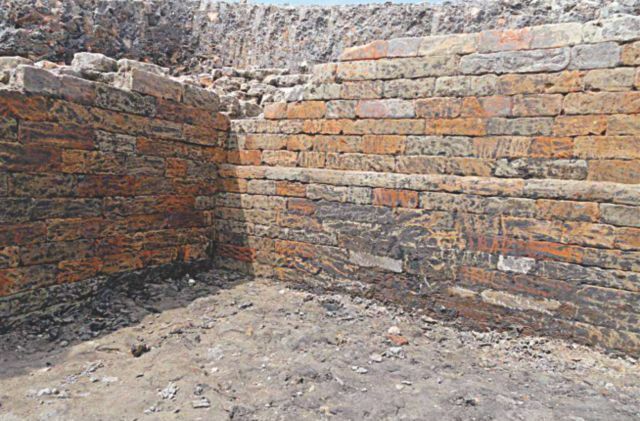 BANGLADESH – Gopalganj - Archaeological excavators on Thursday detected a thousand-year-old brick-built water reservoir at Gopalpur village in Ghoraghat upazila under the district. The unique archaeological site is at a place surrounded by moats in a two kilometre radius area, said Swadhin Sen, associate professor of the Department of Archaeology of Jahagirnagar University. “The structure of the water reservoir was built between 10th to 11th century. Such a reservoir of that period has been fond first time in Bangladesh. The area was part of Bharendra region and under the rule of Pala dynasty,” he said. The water-reservoir measures 33 X 28 metres and the remains of the ghat (landing stage) measures 6.5 × 6.8 metre. Malai Kumar Sain, a pottery expert and researcher of Calcutta University, also a member of the excavation team, said after analyzing the brick structure said the structure was built between 10th to 11th century. “Such water architectures are not uncommon in India. Julia Hegewold, a Professor of University of Bonn, has carried out survey on different water architectures of South Asia and found different kinds of water reservoirs like ponds, kundis and stepped wells. Other forms of water architectures were also detected in Karnataka, Mathura, Chandraketugarh, Maharastra and undivided Bengal,” the chief of the team said. The brick walls of the ancient reservoir were badly damaged as locals took away bricks from there at different times. 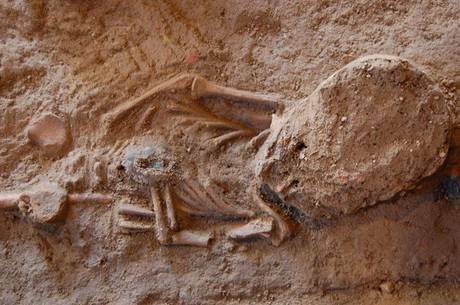 According to the locals, a few sculptures found at the site were earlier handed over to Mahasthan Museum. “It is a rare discovery. The structure is a unique one in Bangladesh,” said Afroza Khan Mita, assistant director of the Department of Archaeology, Ministry of Cultural Affairs, during her visit to the site. On March 27 this year, the 40-member-team led by Prof Swadhin Sen started excavation at Belwa and Gopalpur village of Ghoraghat upazila. It is scheduled to end on May 10. Earlier in 2011, a team led by Prof Dr Syed Mohammad Kamrul Ahsan of archaeology department of Jahangirnagar University conducted a survey in Ghoraghat upazila and found 52 archaeological sites there, said Syfur Rahman Polin, a researcher of the team. PHILIPPINES – Ifugao - The Ifugao landscape offers to provide anthropologists a new dimension in the study of agricultural intensification and the development of political economy. Most models that explain the development of agricultural systems suggest evolutionary relationship between extensive and intensive forms of production. Corollary to determining cultural processes in Ifugao, this work also aims to resolve debates on the antiquity of the entire Cordillera terraced field tradition. Archaeological and ethnohistoric work will confirm whether the conventional ‘long history’ or the revisionist 'short history' more accurately represents the occupational history of this region. Research sites are located in the UNESCO World Heritage Sites of the Ifugao Province (Cordillera, Philippines), where little previous archaeological research has been undertaken. 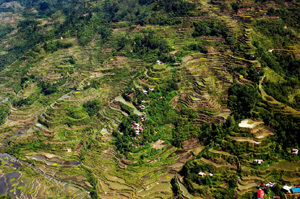 The need for such research is particularly urgent because the area's terraces are rapidly deteriorating as increasing numbers of Ifugao farmers leave their traditional farming occupations and their rice terraces fall into disuse. This study generates archaeological findings that are directly relevant to understanding and conserving Ifugao irrigation technology and heritage, and also expands our anthropological knowledge of water management in the non-industrial world. ROYAUME UNI – Nayland - Two Elizabethan coins, thought to be possible fakes, were among hundreds of objects found during a three-day dig in Nayland’s gardens. The excavationwas held in October. Details of the finds, including hundreds of pottery items from Roman, Anglo-Saxon and early medieval times, were revealed at a village hall meeting. Nayland was one of six locations chosen for the community archaeological project, with metre-square pits dug in 33 gardens and open spaces from Bear Street to the Anchor Bridge. All the items unearthed, including bottles and medication, were taken to Cambridge University to be assessed. Dr Lewis, of Access Cambridge Archaeology, said it was possible to see where the core of the village was founded. CANADA – Nanaimo – Members of a Nanaimo First Nations group are outraged after crews contracted by BC Hydro damaged a documented ancient rock art site during work last week. Douglas White, chief of the Snuneymuxw First Nation said the damage is disrespectful of native heritage and he doesn’t understand how crews could make the mistake, since existing petroglyph rock art sites are documented and protected by legislation. Petroglyphs can be more than 2,000 years old and typically feature etched drawings that serve as a record of First Nations history on the surface of flat bedrock sandstone. FRANCE – Moissac - Découverte de deux tombes au Patus et d'un sol en dalles de terre cuite. Il s'agit bien d'un intérieur que les travaux ont permis d'exhumer, celui de l'ancienne chapelle dédiée à Marie par les moines. Les bénédictins de l'ordre de Cluny disposaient toujours, dans ou près de leur cloître, d'une chapelle vouée au culte de la Vierge, mais curieusement, le cloître de Moissac n'en montrait pas de trace. Elle était pourtant là, sous l'esplanade du Patus, enfouie sous la construction du bâtiment aujourd'hui disparu qui a servi de tribunal et de prison au début du XIXe siècle. Les premiers vestiges dénudés qui ont permis l'identification de ce lieu de culte consistent en ce sol carrelé, qui s'arrête au pied d'une banquette bâtie contre un mur de pierre. à environ 6 mètres face à cette assise, on reconnaît le vertical de la banquette symétrique. «Le reste de la chapelle, indique M. Georges, archéologue, disparaît sous la rue où les camions de chantier ont encore besoin de passer.» La poursuite du creusement en direction du palais abbatial ne devrait donc pas être immédiate. Au cours du tri des matériaux, une étrange grenouille verte en terre cuite a fait son apparition. Autre curiosité : si le carrelage révélé a été approximativement daté du XII-XIIIe siècle par Chantal Fraysse, la tranche du creusement montre l'existence d'un autre carrelage, plus ancien, à une dizaine de centimètres en-dessous.